Massachusetts policy makers decided to go beyond existing ARRA federal reporting requirements and collect additional data in order to gauge the effectiveness of ARRA’s fiscal policy by counting the number of individuals who have received an ARRA-funded paycheck. In addition, policy makers wanted to look at some of the demographic characteristics of this population. 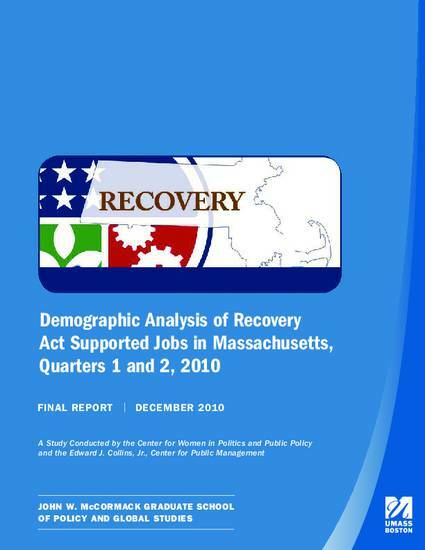 This report provides an in-depth analysis of the data that the MA Recovery Office collected during the first and second quarters of 2010, with a particular focus on job creation and retention by race, ethnicity, gender, disability status, and geographic location. Highlights of the report include: Each racial or ethnic category is represented in both the ARRA and larger labor force in roughly the same proportions. Blacks and Hispanics constituted a slightly larger proportion of ARRA job holders than among those employed in the larger labor force during the same time period. Women were about two-thirds of ARRA job holders funded by Workforce, Safety Net, and Education categories across both quarters. Neighborhood analysis of the City of Boston showed that certain Boston neighborhoods – especially those with considerable racial/ethnic diversity – had a greater share of ARRA job holders than others. A Study Conducted by the Center for Women in Politics and Public Policy and the Edward J. Collins, Jr., Center for Public Management.